Though we are not associated with Invisible Fence®, we can provide independent support for invisible dog fencing systems, and most other electric pet fence systems such as Invisible Fence®, DogWatch®, Dog Guard®, Innotek®, etc. We can repair wire breaks and exposed wires, or provide troubleshooting support and general maintenance. Contact us today to find out how Kentucky Dog Fence can help keep your Invisible Fence® functioning and your pet safely and securely contained! Hello, I need support for my existing pet fence system. If you’re a current owner of an Invisible Fence® or other brand of dog containment system, you’ll be happy to hear that you can upgrade to a premium Pet Stop® system at reduced price when you swap out your existing system. Inquire now! 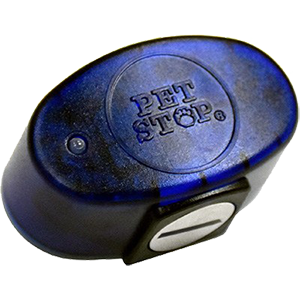 Our Pet Stop® receiver collars can be programmed to work with Invisible Fence® (as well as other electronic pet fencing brands). Already own an Invisible Fence® underground pet fence system? Ask us about purchasing Invisible Fence® compatible batteries and receiver collars at a savings.